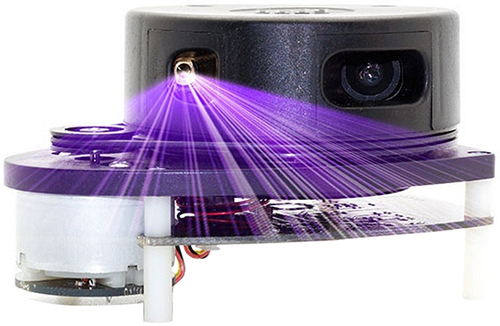 RPLIDAR A1 is a low cost 360-degree 2D laser scanner (LIDAR) solution developed by SLAMTEC. The system can perform a 360-degree scan within the 12-meter range (6-meter range of A1M8-R4 and the blowing models). The produced 2D point cloud data can be used in mapping, localization and object/environment modeling. RPLIDAR A1 contains a range scanner system and a motor system. After power on each sub-system, RPLIDAR A1 start rotating and scanning clockwise. RPLIDAR A1 contains a range scanner system and a motor system. After power on each sub-system, RPLIDAR A1 start rotating and scanning clockwise. The user can get range scan data through the communication interface (Serial port/USB). RPLIDAR A1 comes with a speed detection and adaptive system. The system will adjust the frequency of a laser scanner automatically according to motor speed. And host system can get RPLIDAR A1?s real speed through the communication interface. The simple power supply saves LIDAR system?s BOM cost and makes RPLIDAR A1 much easier to use. Detailed specification about power and communication interface can be found in the following sections. RPLIDAR emits a modulated infrared laser signal and the laser signal is then reflected by the object to be detected. The returning signal is sampled by vision acquisition in RPLIDAR and the DSP embedded in RPLIDAR starts processing the sample data, output distance value and angle value between the object and the RPLIDAR. Through processing the sample data is output through a communication interface.